Director Tay's inspirations include "1. Anti-blackness in the Asian American community and lack of Asian allyship for BLM 2. The lack of representation of white allyship that doesn't derail black narratives 3. During my public health degree, I learned about a phenomenon known as weathering in which the cumulative daily effects of racism, minority stress, microagressions literally reduce the lifespan of Black women by 10 years. So I thought, "This is a public health crisis. What if there was an on-demand team to help POC mitigate the effects of racism?" It started as a very satirical concept, but with every day that passes in our current socio-political climate, I find that the WFU becomes an increasingly realistic solution." Evelyn espouses the spirit of the Chinese martial art of wushu -- using your power to defend the weak -- as she attends Harvard Law School with an interest in minority civil rights. "No Program No Peace" gives voice to the students at Wellesley College advocating for a tenured Asian Americanist. After 15 years of student activism, Wellesley now has an Asian American Studies minor, but no funding and no tenured professor. "No Program No Peace" captures compelling student testimonial on the power and importance of Asian American Studies. Many Asian Americans are hyperaware of how others perceive us and sometimes the slightest trigger word can make us think the worst. Everyone worries about self perception to some degree and in this video we explore what happens when an Asian American man is introduced to his Caucasian fiance's family. Ngoc-Tran Vu identifies as a 1.5-generation Vietnamese American transnational and multimedia artist, organizer, and healer. She was born in Vietnam and grew up in Boston where she's currently based. Tran is a member of the AARW board. Click on title to watch the film. My mom reminiscing about her mother and last video I have of my grandmother. During a journey on a train, one woman must work with her teenage and childhood selves to reckon with her childhood trauma. In the 1960's, four Chinese American brothers from Boston's Chinatown served in the U.S. Armed Forces, all at the same time. This video discussed why the Free Lunch Program is important to us. When I first enrolled into an Asian American Studies course, I had no idea that I was getting myself involved with such a big community. When I first stepped foot on campus as a freshman, I never saw myself as being involved on and off campus until the Spring semester of my junior year of college. Being able to learn everything I have from the program, inspired to be involved within the Asian American Community on campus and I was lucky enough for them to have welcomed me with open arms. I am an Asian American who wanted to make a change. I ran for City Councilor in Quincy, Mass despite even being mentally disabled. I lost in the primary vote, but I made noise that got the attention of the incumbent and my entire Ward. This is my ad for the campaign. This video reflects how the current overload of rhetoric is affecting real people. This video is meant to inspire people to stand up against racism. A discussion by South Asian people (femme and non-binary/trans) about the nuances of Asian identity and navigating Asian spaces. Strangers is a podcast hosted by Lea Thau, where she simply talks to strangers. I visualized Thau's podcast and made it into an animation. I gave these voices a visual identity. A grandmother, an uncle, and a grandson answer the same set of questions about high school expectations. How will the generation and culture gaps get reflected in their responses? What We Face explores the gender inequality between Men & Women in America. This film stars Wendy Han & Calvin Dong and is narrated by filmmakers Yuqing Lin and Elizabeth Figueroa. Please join us in celebration of Asian Pacific American Heritage Month! The 7th Annual BAAFF Short Waves: Short Film Competition has begun! 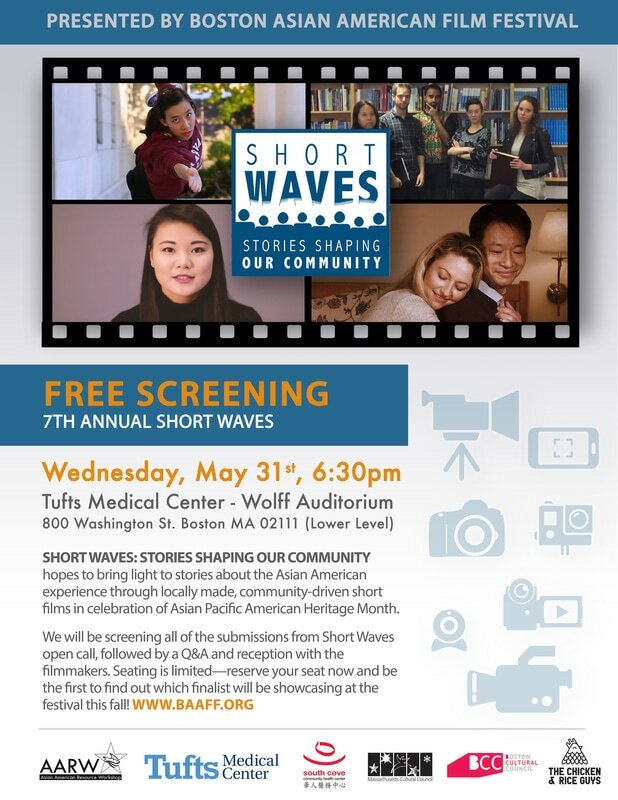 Short Waves hopes to bring light to stories about the Asian American experience through locally made, community-driven short films. We will be serving food generously donated by Chicken And Rice Guys during the reception.